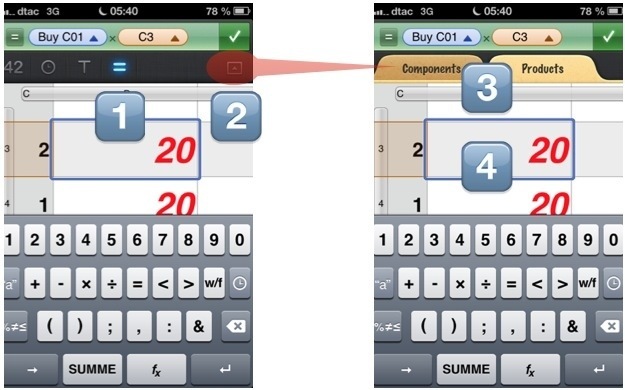 If you want to link various sheets in Apple’s iWork-App NUMBERS here is an example how to do this. You may download the sample in the native NUMBERS-Fileformat. 1 Tap on the cell in the destination sheet you want to link with a cell in the source sheet. 2 Tap on ‘=’ for creating a formula. 3 Tap on the small ‘Down Arrow’ on the right side. The sheets come up for selection. 4 Select the sheet and cell containing the source data. Creating formulas with linked data works in the same way as in a standalone sheet. The only difference is that you have to select the sheet (Step 2) before you refer to cells of it in your formula.